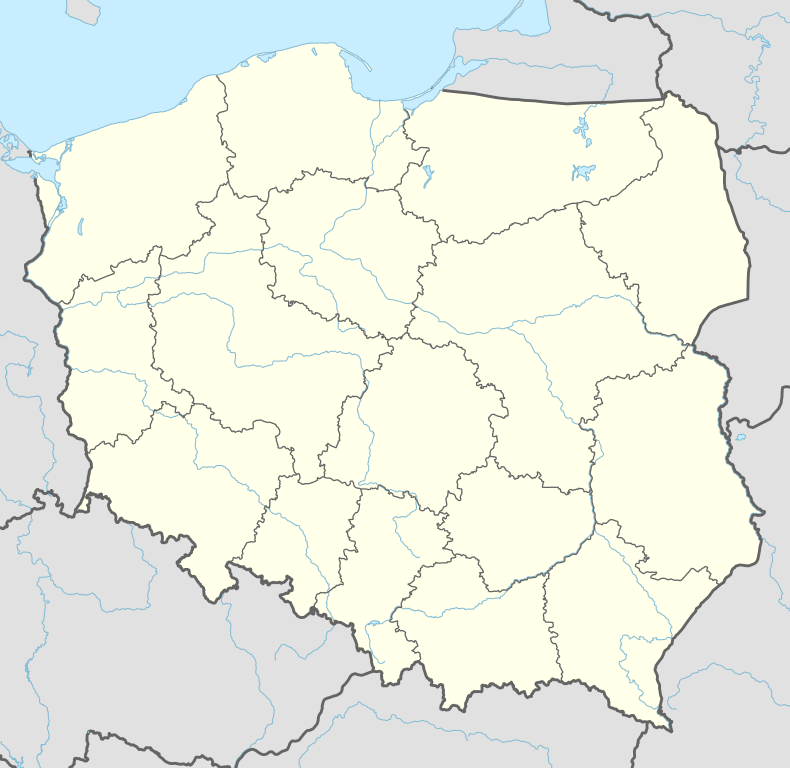 Jedwabne (pronounced [jed'vabne]; Yiddish: יעדוואבנע‎, Yedvabna) is a town in Poland, in the Podlaskie Voivodeship, in Łomża County, with 1,942 inhabitants (2002). First mentioned in 1455, Jedwabne received city rights on July 17, 1736, from the Polish king August III, including the privilege to hold weekly markets on Sundays and five country fairs a year. A wooden Catholic church with two steeples was built in 1737–1738, and a synagogue around 1770. The Jedwabne synagogue was a fine example of the unique Polish Jewish architectural tradition of wooden synagogues. At the end of the 18th century new textile factories opened. In 1851 there were as many as 17 weaving establishments employing 36 workers in the town. In terms of its cloth production Jedwabne was already the eleventh-largest manufacturing centre in the Kingdom of Poland. By 1862, 11 mechanical and 13 manual weaving machines had been installed at Jedwabne. The town's cloth production fell into decline only after the January Uprising of 1863, due to Russian repression against Polish and Jewish entrepreneurs. The town was the center of a large Jewish community; its population in 1900 was 1,941. Following the Soviet invasion of eastern Poland in World War II (in fulfillment of the Molotov–Ribbentrop Pact), a wave of anti-Polish repression by the Soviet Secret Police was conducted between 1939 and 1941. It was preceded by a successful Soviet attack against a Polish partisan unit stationed in the Kobielne Wilderness. The town had 3,985 inhabitants in 1940; some 3,670 Poles, 250 Jews and 65 Belarusians. A number of Polish people with their families were arrested by the NKVD and deported to Siberia. Soon after the German takeover of Jedwabne during the 1941 attack on the Soviet zone of occupied Poland (part of Operation Barbarossa), the town became the site of the infamous Jedwabne pogrom on 10 July 1941. Some 40 Jewish men were killed by Nazis in a barn belonging to Bronisław Śleszyński, followed by a group of an estimated 300 additional Jewish victims with families locked later that day in the same barn, which was then set on fire by Polish men (some tried after the war) in the presence of Nazi German policemen. The next day, according to witness accounts, the Germans created a ghetto in Jedwabne (July 11, 1941) and incarcerated about 100-130 Jews in it. They were shipped to Łomża Ghetto in November 1941, and subsequently sent to the extermination camp at Treblinka. Immigrants to the United States from Jedwabne built the synagogue Congregation Anshe Yedwabne at 242 Henry Street in the Lower East Side neighborhood of New York City. Jedwabne is the administrative and economic centre for the surrounding gmina which has an agricultural character. It offers educational and healthcare services for the community, as well as administrative support, business infrastructure, and investment financing. The town is flanked by the Biebrza National Park, the biggest complex of natural marshes in Central Europe inhabited by moose as well as other animals and bird species, attracting numerous tourists, with Biebrza river nearby, surrounded by campgrounds for fishing, hiking, and mountain biking. The Agrotourism substantially contributes to local economy, with prolonged tourist season beginning on March 1 and lasting until October 30 each year. ↑ (Polish) D. Boćkowski. Na zawsze razem. Białostocczyzna i Łomżyńskie w polityce radzieckiej w czasie II wojny światowej (IX 1939 – VIII 1944). Neriton, Instytut Historii PAN. 2005. p. 120. ↑ (Polish) The 90th session of the Senate of the Republic of Poland. Stenograph, part 2.2. A Report by Leon Kieres, president of the Institute of National Remembrance, for the period from July 1, 2000 to June 30, 2001. Donald Tusk presiding. See statement by Senator Jadwiga Stokarska. ↑ "Gmina Jedwabne". Urząd Miejski w Jedwabnem. 2008. Retrieved September 17, 2012. ↑ "Walory turystyczne". Urząd Miejski w Jedwabnem. 2008. Retrieved September 17, 2012.